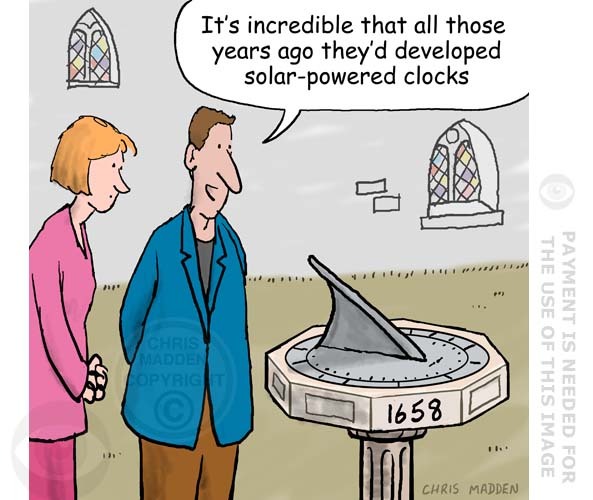 This cartoon was drawn as a tribute to William Heath Robinson on the occasion of the opening of the new Heath Robinson Museum in Pinner (where Heath Robinson lived). 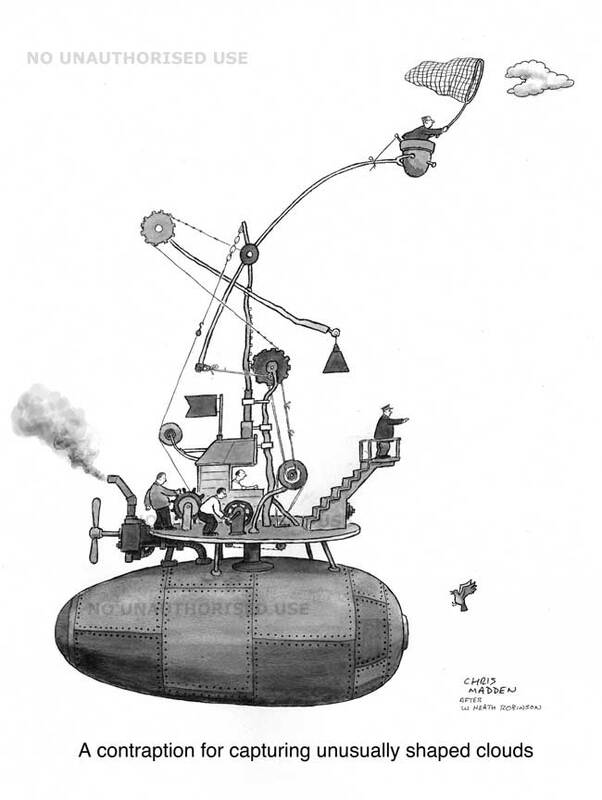 This cartoon shows a Heath Robinson style contraption and is captioned “A contraption for capturing unusually shaped clouds”. 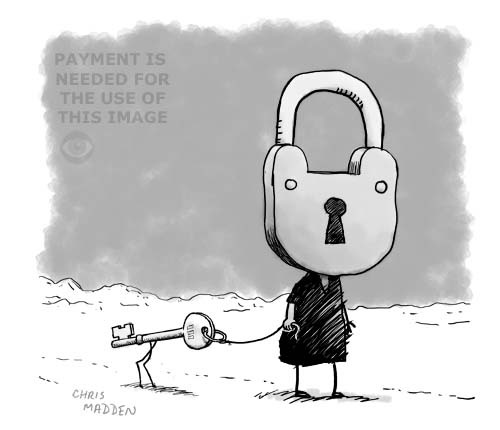 A bizarre or surrealist image showing a person with a padlock as a head – and with the padlock’s key on a lead like a pet dog. The image was created with no specific meaning, although it’s probably an unconscious metaphor for something as it gives the impression of aspiring to be psychologically meaningful. Perhaps it’s meant to refer in some ways to psychology or psychological processes, the workings of the mind, the conceptualisation of ideas and such like. Perhaps it’s about the way that people become locked into particular patterns of thought and behaviour (while possessing the key to their release). 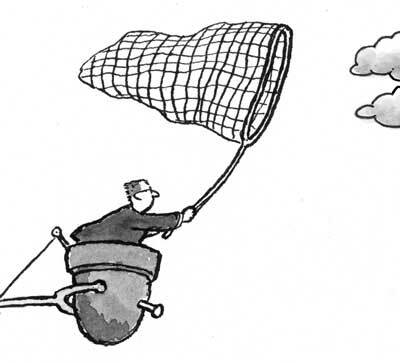 A cartoon about cognition, thought processes, psychiatry, the mind. Walt Disney, the creator of Mickey Mouse, was famously very enthusiastic in controlling the unauthorised use of his cartoon characters. I’m in favour of such control myself, especially when characters are appropriated for financial gain. However representations of famous cartoon characters (or any other images) in order to make a comment is a legitimate use of an image – as here! 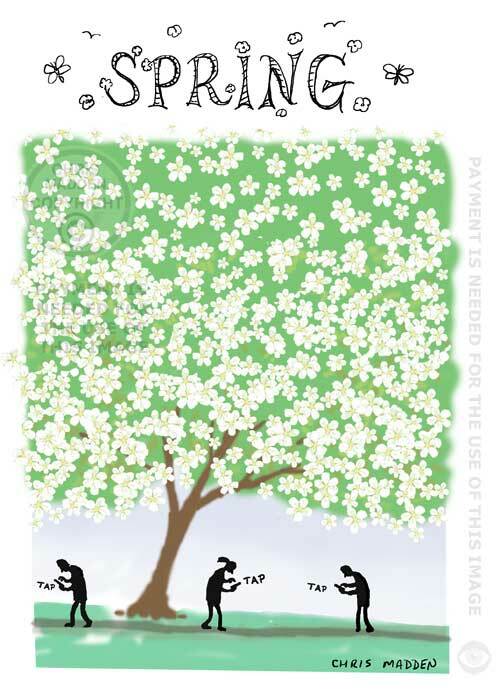 This illustration featured in an exhibition in the Cob Gallery, London, titled Pastiche, Parody and Piracy (June/July 2014). An image showing one of the pyramids of Egypt in flames, as a symbol of the unrest and turmoil caused by the current conflict between the Egyptian army and the Muslim Brotherhood (in August 2013). 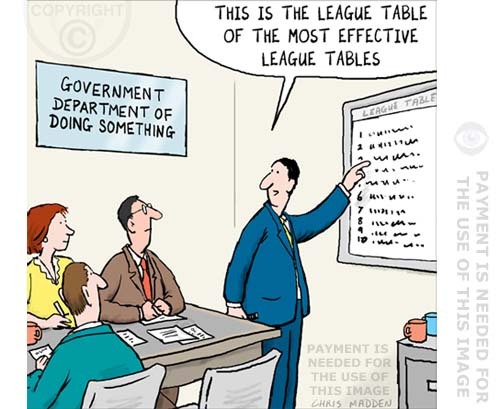 The cartoon was drawn in June 2012 in anticipation of future conflict. 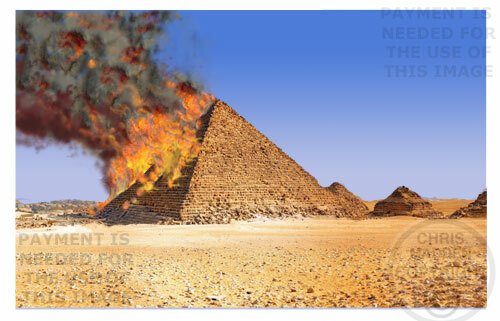 A burning pyramid as a metaphor for civil and religious unrest in Egypt. Yes or No – which will win in a tug-of-war? 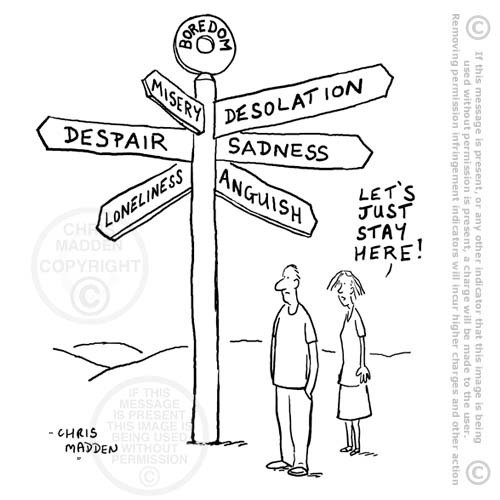 A cartoon illustrating the idea of being pulled in two directions at once, or of indecision. The Adelson checkerboard shadow optical illusion. Which mouse is standing on the darker square – answer, neither! This is how the illusion works. An object (the elephant) on a checkerboard casts a shadow on the board. The parts of the board in the shadow are darker than the parts of the board that aren’t. The human brain knows that the squares on the board are all same – either white or dark gray, so it compensates for the darkening effect of the shadow, making the white squares that are in the shadow seem lighter than they really are (which can be as dark as the dark gray squares, as here). In the top photograph, which square is darker – 1 or 2? Answer: neither, they are the same. This is shown in the second figure, where a uniform gray strip crosses the image to show comparisons in tone between different squares. An object on a checkerboard casts a shadow on the board. The human brain knows that the squares on the board are all same – either white or dark gray, so it compensates for the darkening effect of the shadow, making the white squares that are in the shadow seem lighter than they really are (which, if you get the light levels right, can be as dark as the dark gray squares). Optical illusion due to direction of light – are these shapes indented or sticking out? Are these shapes indented or sticking out? This is a photograph of the word ‘post’ on the side of a British post box (the red pillar box). Viewed upside down the word looks as though it is indented. The right way up it appears to stand out (which it does). 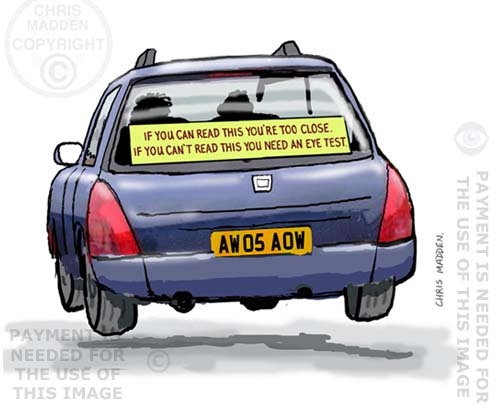 An illustration dealing with the subject of the safe distance between cars, driving safety, rules of the road, transport, road safety. The distance between the tracks of a railway – the gauge – was based on the width between the wheels of horse drawn carriages. The width of horse drawn carriages was determined by the width of horses (or rather of two horses side by side). 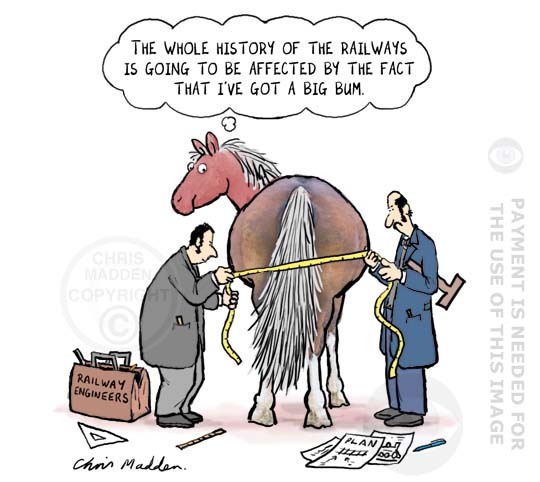 The illustration shows pioneer railway engineers in the Isambard Kingdom Brunel mould measuring the width of a horse in order to determine the measurement for the railway gauge. 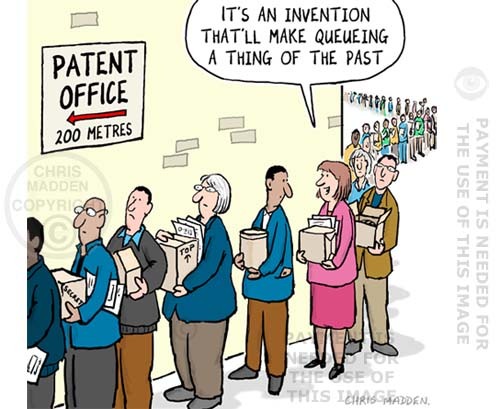 A cartoon showing a queue of people outside a patent office, each holding an invention that needs patenting. Invention that help to get rid of queues include the internet and the telephone. 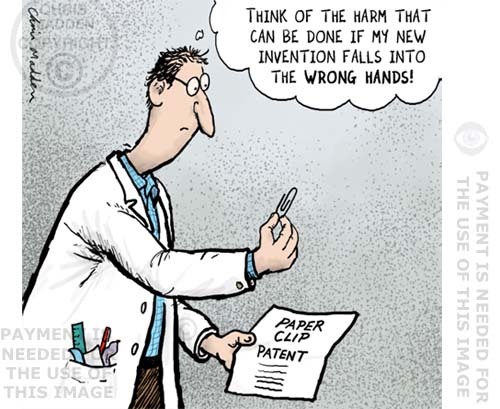 The cartoon is about inventors and inventions, patenting and copyright, intellectual rights, technological progress. An inquiry is to be set up to investigate the horse meat scandal. A cartoon about the scandal of horsemeat being found in convenience meals and beef products such as beef burgers and lasagne. A cartoon about the scandal of horse meat being found in beef products such as beef burgers and lasagne. The product Findus beef lasagne was found to contain 100% horse meat – in other words, no beef. A typographical design that could be used as a poster, postcard, t-shirt design or mug design. This quote was made by me. I think it’s original, although it sounds a bit like the famous quotes that you can read in lists of famous quotes, so maybe I read it somewhere. 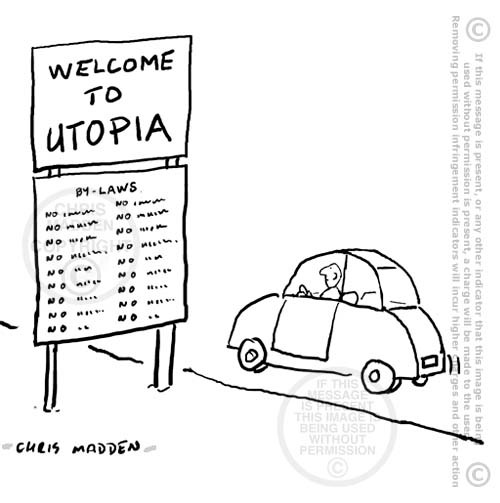 A cartoon illustrating the idea that utopian societies can only exist if they are repressive or prescriptive to some degree (probably a necessary degree to be honest). 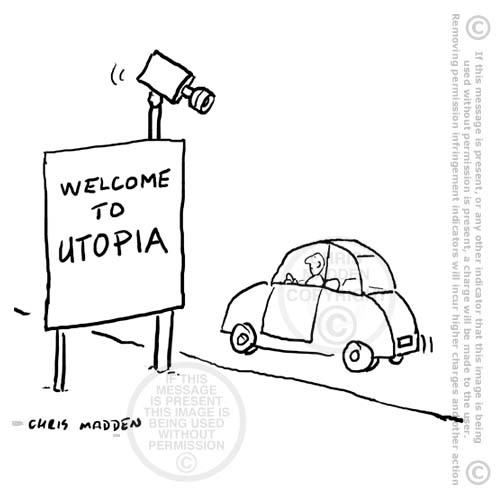 A cartoon illustrating the idea that utopian societies can only exist if they are repressive to some degree (probably a necessary degree to be honest, judging by the nature of human nature). Music cartoon. MP3 files don’t have LP sleeves. An older man shows a young man or teenager something that young people miss out on due to digital downloading of music – LP sleeves. A comic imge about the music industry, music business, marketing, record covers, LP sleeves, vinyl records, 12 inch records, album artwork, dark side of the moon, pink floyd. 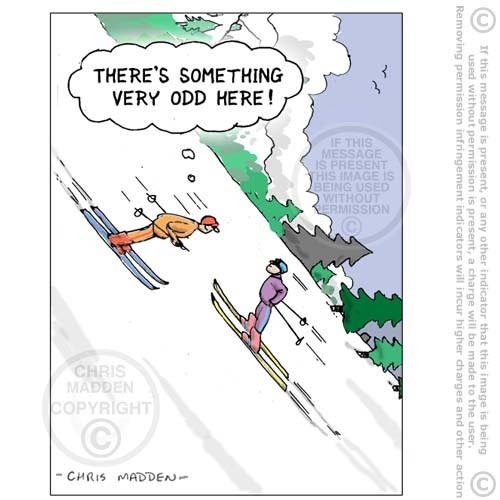 A cartoon showing skiers skiing in opposite directions – one is skiing downhill while the other is skiing uphill. The image is on its side, so when viewed initially the viewer is confused by conflicting visual cues, mistaking the direction of the slope (look at the trees). Mayan 2012 prophecy wrong – what next? The world didn’t come to an end on 21st December 2012 – what news story will take its place? A cartoon about the Mayan ‘prophecy’ of the end of the world at the winter solstice 2012. 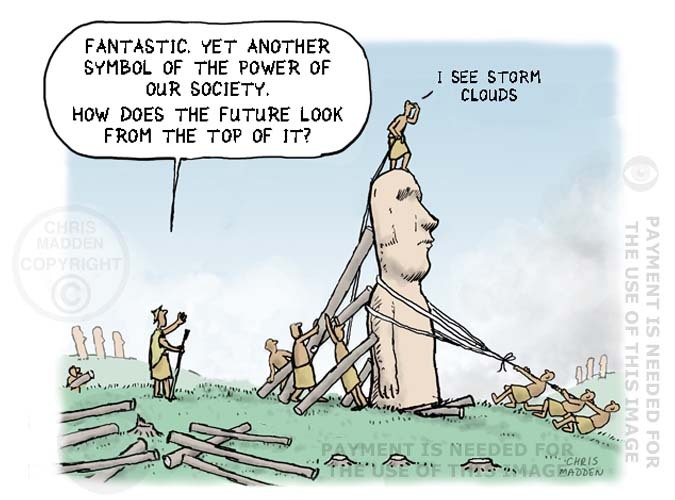 The cartoon is about people’s seeming need for end of the world stories. It is about millenarian stories and millenarianism. Millenarianism is the phenomenon of wishing for or expecting a huge upheaval that will either end the world or will change it radically. The cartoon shows a Mayan gift shop selling a Mayan calendar for 2013, which has been put on display immediately after the world didn’t come to an end on 21st December 2012 (winter solstice). Part of the joke is that the Mayan calendar was not put on display until after the prediction of the end of the world had passed – because the owners of the Mayan gift shop were busy making money out of the Mayan prophecy of the end of the world until then. It’s also about life strategies, competitiveness, power struggles, inter-human dynamics, interpersonal politics, sociology, game theory. A cartoon showing a chess board on which one of the squares is a hole. Cartoon about press regulation – who reports on the reporters? Cartoon – who reports on the reporters? This cartoon is about the subject of press manipulation of the news, press regulation, and who should police the press and broadcasting media. 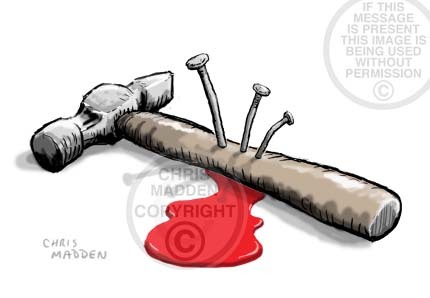 A cartoon about press freedom, censorship, press reporting, press bias, the influence of the press on public opinion.